As solar panels come down in cost, more and more people are thinking about adding solar capibility to their RV. There are several reasons that solar is attractive. Many campers dislike the noise of generators. Solar power is free once the equipment is paid for. The total weight of a solar system is much less than a generator. The one big negative is that a solar system would probably not be able to run your airconditioner as it just takes too much power. There are a number of questions that need to be answered before a solar system can be setup. A. How much power do you really need? B. How are you going to mount the system? C. Which batteries are going to be charged? The answer to the first question is going to depend on life style. Each owner needs to make a list of things that they want to power and how long they need to run that device every day. The following table shows some of the standard loads in a Roadtrek and a guess at how many hours they might be run. You need to make your own table as the time each item is used will change the total a lot. The CO Detector and LP Detector are on all the time and they take 9.36 AH total. The rest of the usage is dependent on the user. In my 1996 RT six of the light fixtures take the 1156 bulbs. The map lights and the large flouresent bulb above the bed are different. This means you can have a much larger load if more than one light bulb is turned on at the same time. Notice that the LED replacements take less that 1/10 the power of the original bulbs. If you replace all the bulbs in the van with LEDs, they can all be on and still draw less power than a single standard bulb. The next important question is how or where do you plan to amount your panels? A little back ground will help here. The optimum situation would be a panel that followed the sun across the sky. It would have an angle that is 90 degrees to the suns rays all of the time. Since this would be expensive, most people make simplifications. A rule of thumb is to mount the panel at an angle that matches your latitude. An example would be that at the 45th parallel the panel would be mounted at 45 degrees. The more important issues is how do you follow the sun? Some people just mount the panels in a fixed location. They then purchase 20 to 30% larger panels and do not worry about the angle. Others mount the panels on a stand which can be moved three times per day. This can give up to 30% more power. A second concern is shading of the panel. If the sun goes behind a tree or even if a portion of the panel is shadded the panel will not make its total wattage. 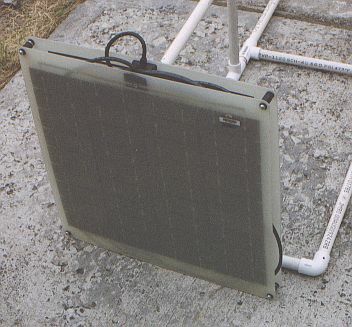 Most panels are a group of solar cells connected in series. If one cell gets shaded the open circuit voltage may not change but the solar panel will not be able to supply the rated current thus the wattage is reduced. Once you have an estimation of your total power usage and decided on a mounting system, you can start to size the solar panels. Your location will also be important. Some places in the world get many more hours of sunlight than others. Some people use 6 hours and others use 8 but I believe that if you can move your panels to follow the sun, you will get can get even more. Using the 23 AH from the table above as an example, here is how the calculations would be done. Panel Wattage = (I X E)/Hours I is the total Amp Hours needed from the chart above. The E is the voltage needed which will be 12 Volts. Hours are the number of hours of good unshaded sunlight available. This calculation ignores the fact that some panels are rated at 12 volts and others at 14.5 for their wattage. 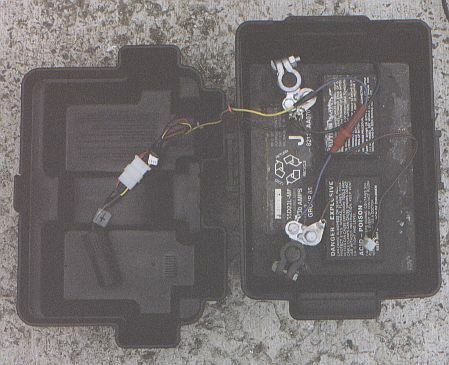 Since the CO and LP detectors are on all the time you will never see a totally unloaded battery. Better vendors rate their wattage at 14.5 volts because an unloaded battery will float up to that level. Notice that the last column in the table above shows that RT battery usage is from both the house and the motor battery. You have to plan someway to charge both batteries. On first thought you might think that connecting to the center post on the battery isolator would charge both batteries but there is a draw from the alternator field winding which would take up a lot of power. This is not a good solution. I have chosen to put two sets of connectors on my panels. One will charge the house battery and the other will charge the motor battery. The house battery has a much larger load so it will be charged most of the time. Solar panel technology is moving quickly but at the time of this writing, 5$ per watt is a good rule of thumb. If you are purchasing very large panels the cost will be less but most RT's will not have room for those very large panels. If you plan to let your RV sit with the panels connected to the batteries, you need to purchase a charge controller. This will prevent the batteries from being overcharged. These range from $20 to $30 for small systems. Many questions have been asked about battery preformance as well as how to know if the battery is being charged correctly. Here are some ideas on how to answer these questions. 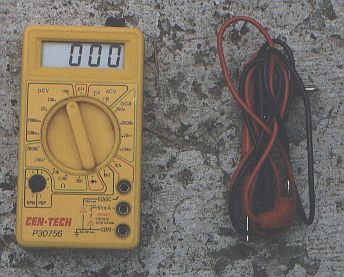 A good digital meter is needed as some of the voltages you will need to measure are small. In the past this cost a lot of money but today that has changed. The following meter was purchased at Harbor Freight for less than $10. There are really two measurements that define battery preformance. You need the voltage of the battery and it is very nice to know how much current your solar system is putting into the battery. 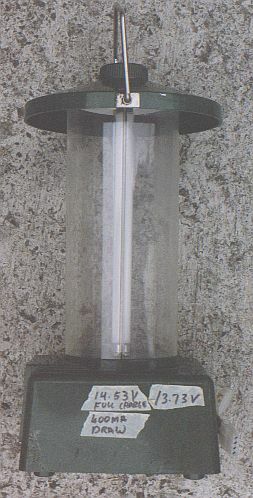 The same circuitry can be used to measure the discharge current. People often measure the open circiut voltage of a battery and say this battery must be charged because it is sitting at 14.5 volts. A battery that has lost most of its capacity will still pass this test. A better test is to load the battery with about a 1 amp load and then measure the voltage. This gives a better idea of the state of battery charge. 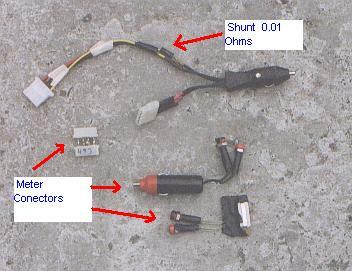 The system I have, used a 0.01 ohm resister in series with the charging system or with the load. This means that you will read 0.01 volts per amp. You can also put the meter in DC current mode and measure the current directly. Normally this works fine for a one time measurement but if you want to monitor usage in an on going fashion, the shunt reistor is a better option. Since I have done a lot of work on PC's in the past I have chosen to use connectors that have been cut off defective PC equipment. I have also chosen to use the standard auto connectors also. This allows me charge any auto sytem as well as charge other items that I have setup. What follows are some pictures of a set of panels which would probably be considered as a minimum for an RT. Three 20 Watt panels were purchased on ebay for a total of $300. This is exactly 5$ per watt. These are the newer type that are circuit board based and they came without any frame or glass cover. The panels are then bolted together for storage. The panels are stored in the drawer which is over the front seats. Since this type of panel comes without any rack, I made one from PVC. This takes one special fitting which is shown in the following picture. Here is a picture of the three panels mounted in the PVC rack. The panels are mounted to the rack by drilling a hole through the PVC in the corners. The rack is not glued so it comes apart for storage. On my last trip I took an extra battery along. This was an old standard car battery that had allready lost most of its capacity. The interesting thing about this battery is the box as it can be moved around for use in a remote location from the RV. It can be taken to the beach or a picnic table. We used this battery to power a 600 watt inverter which provided 120 volts for tools and things that needed power at remote locations. Notice that it is also fused so some simple mistake does not burn things up. A friend gave me an old floursent light that ran off a 12 volt lantern battery. 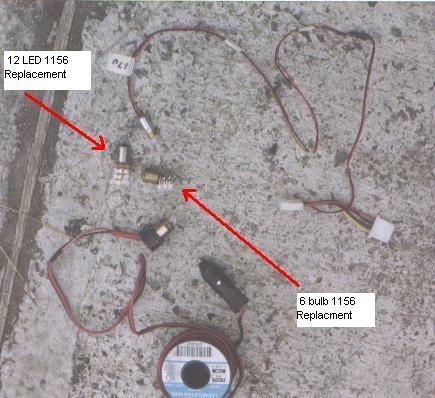 It had been left in the bottom of a boat until the battery had leaked and ruined much of the inside of light. I cleaned out the mess and installed some "D" size nicads that I had laying around. This pack was fused just to protect in case of a short. I fully charged the pack and then measured the voltage with one panel connected and in float mode. This was then marked on the outside of the box so that a simple volt meter reading would allow the state of charge to be tested. I then added PC connectors, so this can be setup in a feed through mode. We used this to light up our lawn chair area in the evenings. We found that you could use this for about 9 hours between charges. Some information on the internet has shown that floresent lights are actually more efficient per lumen of light output when compared to LED lighting. This may well be true but floresent lights work well when lighting up a large areas where all this light can be used. LED lighting works best in smaller areas where the light needs to be more focused. Here is a pucture of the LED 1156 replacement along with some other lights that we used for different purposes. 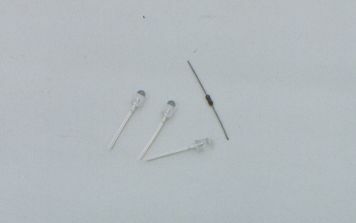 Here is a picture of the LEDs, as they were purchased, that were used to create it. Most parts outlets sell these LEDs for lots of money. These were purchased off Ebay in lots of 100. They were offered for less than 40 cents each.